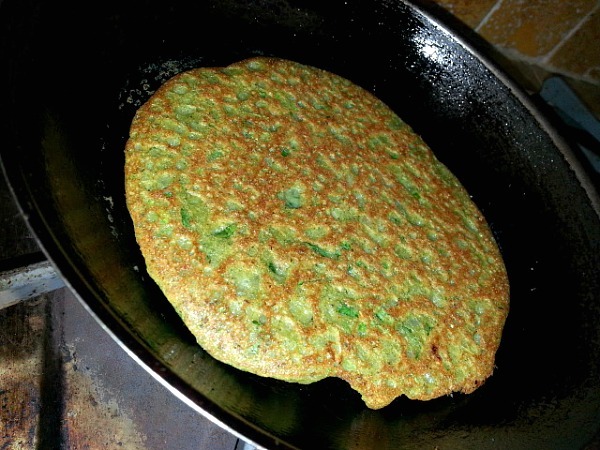 I just made The Mung Beans Pancakes recipe last week and loved it right away. Since I try to eat right as much as I can and as my husband is on a detox diet It takes creativity to work with limited spices and foods. His diet restricts beef, pork, night shades veggies, tomatoes, chili, rice and sugar. To save me the extra work of cooking separately for us both and the kids I decided it was easier to jump on the wagon. I try to 🙂 follow a gluten-free, low-fat and reduced sugar diet which in itself is hard to follow. I usually cook Moong Beans Dal into a thick dal as I like to use it as a substitute for my rice cravings. But last couple weeks I have made it and found it tough to get through the pot. 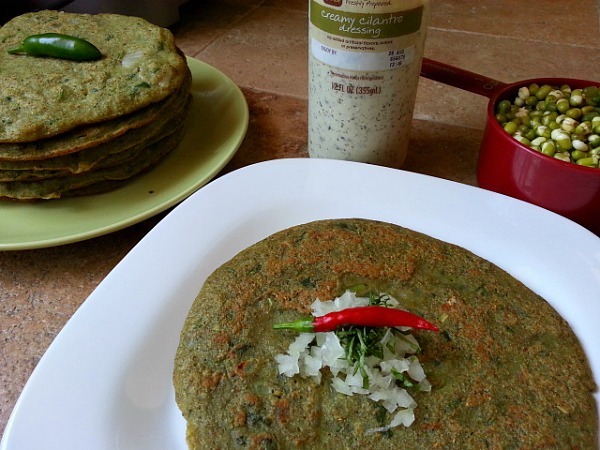 So this recipe of mung beans pancakes was a great switch and got a thumbs up from the hub’s. 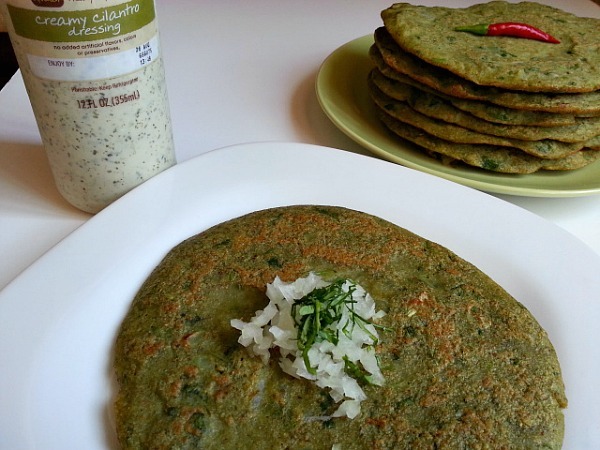 This pancake recipes uses whole mung beans but you can use the halved or cleaned white beans. I like it ground with the rich dark skin, it makes me feel that its more nutritious 🙂 On my first attempt I just used the spice mix with onions and cilantro. The next time I added ginger and garlic and it made a big difference in flavor. I also add a lot of onions as it keeps the pancake moist. These pancakes can be a bit stiff to make it soft I added baking powder (I do not use baking soda as I had a bad experience once when I used it in a cake). If you soak more than you need then just freeze the remaining soaked mung beans till you need it next time it should hold for a couple of weeks. This recipe is easy to prepare and so healthy. It works well if you are following the Energize your Life Meal Plan. Has a high protein and fiber content and is vegetarian and vegan friendly. In a blender add the first 4 ingredients mung beans, ginger, garlic and water and blend it to a smooth mixture. 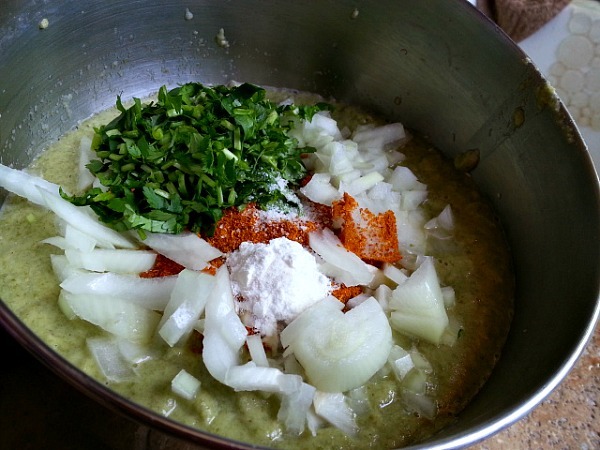 Pour into a bowl and add the remaining ingredients diced onions, baking powder, xacuti masala, cilantro and salt. Mix well. In a hot non-stick pan spray some oil and spoon in about 1/3 a cup. Since it is a thicker batter spread it around the pan and cook covered on medium low heat for 3 minutes on one side. The pancake should look dry. Flip and cook it covered for another 1-2 minutes. Repeat the above step till all pancakes are done. Enjoy it with ketchup for breakfast. Or with freshly made Pico de gallo for Lunch. My all time favorite is the Creamy Cilantro Dressing from Fresh & Easy. Next Next post: Low Carb Chai Tea, Goan Style! It’s been years since I’ve cooked mung beans. I should get some and try these. I’ve been experimenting with besan/gram flour pancakes and this looks like something I’d love. Sounds interesting. I have never used Mung beans. 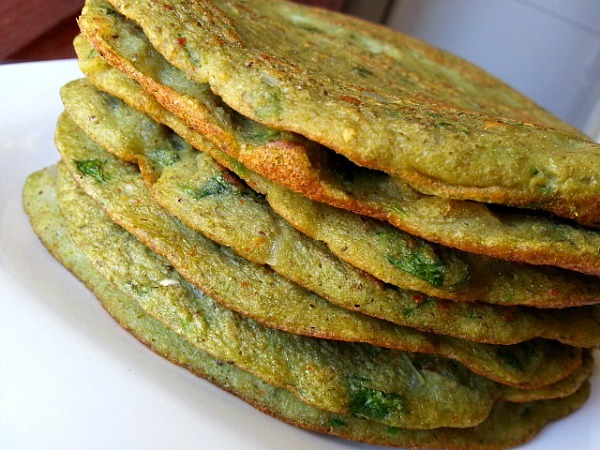 Definitely a new take on mung bean pancakes (for me anyway). OMG I almost forgot about this recipe. Infact, I never made it for my children. I simply remember my mom making it for our lunchboxes. Delicious! I am soaking some mung beans right now 🙂 Thanks for reminding me. These look delicious. I just bought a big bag of mung beans for my fav dal recipe so I will try this recipe out too. Yummy. They look very healthy. Must give them a go. And with xacuti masala too! Who would have thought! Thanks, Nandini. A very creative idea. I’m addicted to Mung Dal, so I must try the pancakes. What a fabulous idea to add spices!! I tend to make my mung beans pancakes as wraps. I use a spatula to spread them as thin as possible and then I serve them with fish with chili and tons of cilantro and some wasabi lime yoghurt. Yum! These look really good and sound tasty too. I’ve never made these type of pancakes but I do have some mung beans in the cupboard so I will try and have a go. Normally I just sprout the beans and use them in a salad so this would be a nice change for me. Thanks Corina :-). I hope you do. They are a great change to sprouted beans and are easy to make and very satisfying. I would like to try these. They looking so good! Looks yummy! 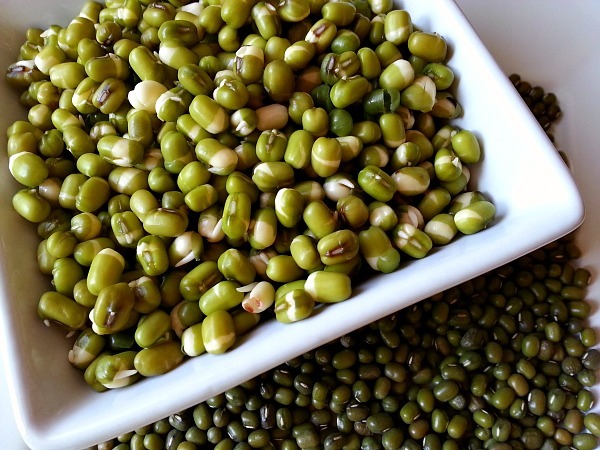 I’ve never had mung beans — can you describe their flavor? Thanks for the recipe! Thanks Liz :-). It has a similar texture to garbanzo beans and if you soak it overnight or sprout it (I hope I am right in describing it 🙂 ) then it taste like beans sprout that you get at the stores. We make something very similar in Andhra Pradesh called Pesara Attu….this will be something different to try while keeping close to the tradition. This looks wonderful! I tried soy bean pancake before and will definitely try this one! Thanks Jing :-). I haven’t tried soy pancakes I bet it will be equally good.